So what makes a car safe? There are two types of safety systems in today’s cars: passive and active. Active safety systems help keep the car under control and prevent an accident, while passive safety systems protect the driver and passengers from injury if an accident does occur. Active safety systems include features like anti-lock brakes (ABS), traction control, electronic stability control, and rearview cameras. Some passive safety systems include seatbelts, airbags, rollover bars, and head restraints. Together, these systems work to minimize the likelihood of a collision and protect you in the event a collision occurs. Both active and passive systems are constantly being improved upon and implemented into the next wave of car models. With so many safety features available, how do you decide which ones to look for in a car? Consumer Reports suggests that some of the most important features to look for in a car are ABS, traction control, and advanced airbags (including side and side curtain airbags). They also rank tire pressure monitors and accident avoidance systems (which include lane departure warnings, and blind-spot warnings) very highly as well. Other sources, such as the Insurance Institute for Highway Safety (IIHS) are quick to emphasize, electronic stability control is a must. Which cars are the safest in general? The IIHS and the National Highway Traffic Safety Administration (NHTSA) rate each car model on its safety. It’s recommended that you look for a vehicle with the best safety rating possible from both, meaning it has scored highly with both organizations. You can find a complete list of the IIHS Safety Picks online, as well as ratings from the NHTSA. Size is also important to take into consideration. Generally, larger cars are safer than smaller cars, because they offer better protection in the event of a crash. However, larger cars are usually more expensive and have a higher rate of fuel consumption than their small to mid-size counterparts. You also want to be aware of the size and power of the engine. It can be very tempting to see how fast a car with a large, powerful engine can go. This is especially true for teens, who are less likely to perceive risks. This all sounds expensive; do I have to buy a new car or can a used car be safe too? Of course! Just because newer cars have might have the most up to date technology that doesn’t mean older or used cars are obsolete death traps. In fact, the vast majority of teens on the road are driving used cars. Realizing this trend, the IIHS has published a list of the best used cars in the under $20k range and under $10k range. 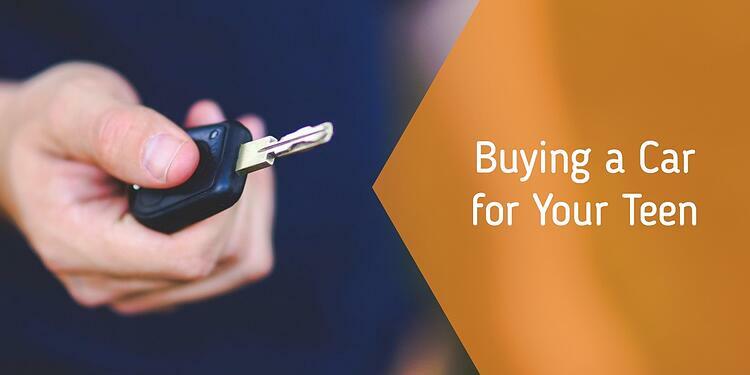 Buying a new car shouldn’t be a split-second decision. It’s going to take a lot of thought and research to find the right car to meet your safety concerns and budget, not to mention figuring out how to insure a new driver. But once you find it, you’ll be able to rest easy knowing your teen is safe on the road. Is your teen ready to learn how to drive? Find out everything you need to know about driver's ed and what you can do to help with our FREE eBook for parents!